Following the devastation wreaked by Hurricane Camille on New Orleans in 1969, Crescent City Soul Queen Irma Thomas relocated to California, temporarily putting her music career on hold and quietly taking a job in retail. That would all change when she connected with Swamp Dogg, whose expertise in writing love songs from a woman’s point of view has proven to be virtually unparalleled. “That’s one of the easiest things in the world for me to do,” he told writer Ray Ellis. “I was raised by super-strong women,” he explained, as was his life-long co-conspirator Gary U.S. Bonds. “We knew more about what women think, just from sitting around listening or being told things, than men.” For proof, one need look no further than “She’ll Never Be Your Wife,” the deep soul heartbreaker that he wrote, recorded and released (on his own Fungus label) on Thomas in 1973. Further evidence is sandwiched within the grooves of the LP that followed, In Between Tears. Like the single, the album featured the straight-to-the-core song writing and gospel-tinged production of Swamp Dogg, the guitar of Duane Allman and the resigned melancholia of a wise-beyond-her-years Thomas. 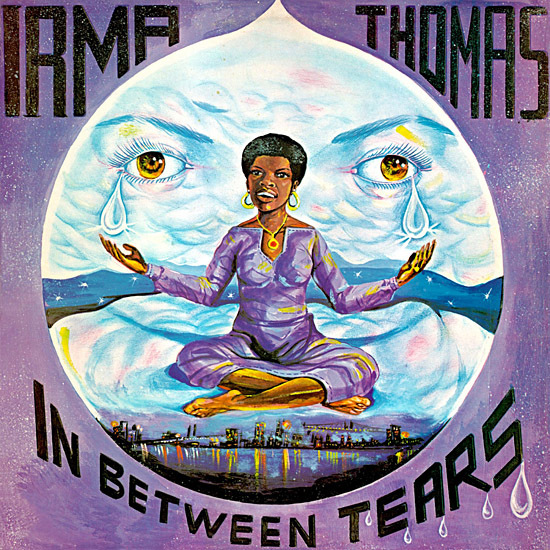 Under appreciated in its time, In Between Tears is now rightfully considered one of Irma Thomas’s finest works. Brought to you courtesy of the unique talent, hustle and vision of the one, the only, Swamp Dogg. In Between Tears has recently been re-issued on Vinyl and iTunes by Alive Natural Sound records. Swamp Dogg will be performing at the 11th Annual Ponderosa Stomp in New Orleans on October 4th, 2013.